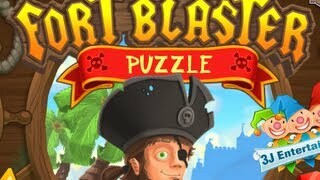 Click on the Play Button and 'Fort Blaster Puzzle' will start after this message... Thanks for waiting! Help this brave viking rescue his wife, who was kidnapped by an evil dragon hidden in a Valhallan mountain. Gather some courage and start matching similar gems to break the barriers that prevent you from climbing the mountain. Create new weapons, learn new attacks and accomplish your mission, warrior! Join this masked hero in his search for hostages inside an abandoned building. Get in the elevators and move around looking for diamonds and evildoers. Will you save every citizen? Enter the Pirate In this game similar to Sokoban, a ninja is the main player. Move the items so that you can reach the treasures. Oink, oink! Pigs are at war! The most effective weapon is being a kamikaze. Kill as many pigs as you can with chain reactions. You'll control a highly-qualified sniper who must trust his instinct to complete his missions. Tactical thinking will be the key to success. Enjoy this Uncontrollable game! In this unique platformer every button is switched or not actually working. Try to guess the controls in each stage and reach the exit. Good luck! Use logic and solve every puzzle. You'll have to take this robot to the blue platform and turn the light on. Arrange the arrows given at the right part of the screen to do so. Help this pirate rescue his lover declare at war with the British army.